The Youngstown State University women’s basketball team has a five-game homestand starting with a game Friday night against Horizon League-leading Wright State University Raiders. The Penguins sit at 12-5 and third in the Horizon League at 4-2. They don’t have a road game until the Feb. 8 matchup at Indiana University-Purdue University Indianapolis. YSU has an 8-1 record at home, the only game they dropped was the 58-56 contest to Yale University, giving the Penguins an edge. 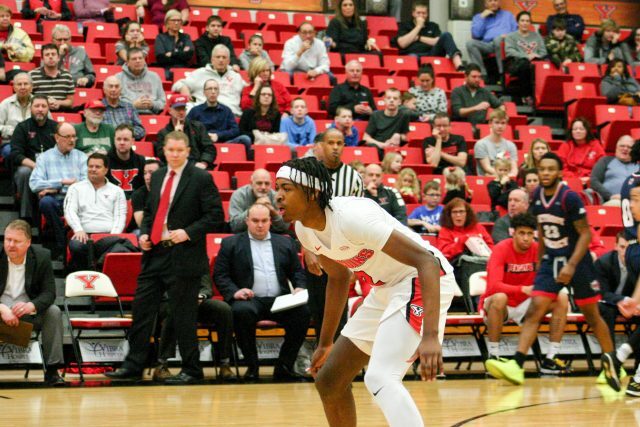 YSU is returning home after dropping two straight road contests to the University of Wisconsin-Milwaukee and the University of Wisconsin-Green Bay. The Penguins fell in overtime to Milwaukee. Alison Smolinski has a comfortable lead in the Horizon League with 59 3-pointers, 25 more than the closest behind. Senior guard Melinda Trimmer leads the Horizon League in assists with 75 and assists per game with 4.4. The Penguins also lead the Horizon League in defensive rebounding, averaging 30 rebounds a game, and defensive rebounding percentage, boasting a 0.757. YSU has the top scoring defense in the conference, allowing only 54.9 points per game. Chelsea Olsen is second in the conference, bringing down an average of 6.9 boards per game. Right before the road trip, the Penguins had a big game on multiple fronts. Not only did the team defeat IUPUI, Smolinski set the all-time 3-point record, draining her 210th career 3-pointer. In addition, Barnes earned his 250th career win and put himself into sole possession of second place all-time wins, with his 94th as the Penguins coach. The Penguins take on Wright State on Friday at 7 p.m. and have a quick turnaround when they face Northern Kentucky University Sunday at 1 p.m.